The man looks a bit like one of these 1980s soccer stars who have gotten long in the tooth somehow. However, he is totally engrossed, the eyes are closed, he silently sings with his instrument. Absolute commitment, total symbiosis. The double bass is between his feet, he rocks and shakes it wildly, he treats it like an electric guitar, no … like a lover, he is dancing with her, stroking her. Watching Barry Guy play for the first time is something you will never forget. He is a legend. But even if you are Barry Guy releasing a sax-bass-duo record in 2012 you have to compete with lots of other outstanding records with the same instrumentation. Some of them released this year (Pedro Sousas and Hernâni Faustino's Falaise) and some of them your own landmark records (Incision with Evan Parker or Sinners, Rather Than Saints with Mats Gustafsson). Especially with Evan Parker Barry Guy has had a long history of marvelous duo recordings. What is new here is that he has teamed up with the Lithuanian multi-reeds-player Liudas Mockūnas (on soprano, tenor and bass saxophone) for the first time and the result is pure magic again. 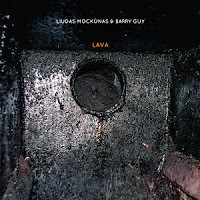 Lava is an album about geological forces and phenomena in space, it compares volcanoes with black holes. The first piece, Nebula I, starts really calm but you can already feel that there is something about to erupt, it is seething under the surface, the music is jerky, sax and bass are really hectic, there is a constant up and down. On Nebula II the sax is almost beautiful, but the bass is stirring in the primordial ooze. Nebula III is inevitable: an outbreak, really short, a pure punk piece, out of the blue, tenor and bass puke right into your face, it startles you if you are not prepared. Fumarole (a vent in or near a volcano from which hot gases or steam are emitted) is a percussive piece, deeply growling, dangerous, it closes the first side of the LP. And Liudas Mockūnas? Especially on bass saxophone he is a unique player and it is obvious that he and Guy make a stupendous team, we are able to look at an energy phenomenon. Event Horizon, the first track on the B-side, literally is this black hole inside which gravity is strong enough to prevent all matter and radiation from escaping. Not the slightest bit of energy is lost, it is in the hole itself (or in the group, and we can listen to it), there is an enormous density between the two players, and you can feel that in Singularity as well, the track is like a rain of meteorites turned into sound. Dark Matter, the last piece, also deals with this question. Is it possible that such a strong unit loses little or no detectable energy? Does it even exist? Listen and become a believer. The album is released as vinyl only and limited to 300 copies.